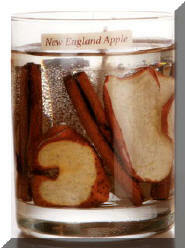 Our new New England Apple Gel candle. Made with real Apple slices & cinnamon sticks. This beautiful candle can be re-filled with either a tea light or 10 to 15 hr votive candle. Absolutely beautiful when it is burning with the incredible fragrance of a fresh New England Apple. This item is gift boxed in a clear cylinder box with cap. Be the first to review “Apple Gel Candle” Click here to cancel reply.